Published: Jan. 1, 2014 at 09:49 p.m. Updated: Jan. 2, 2014 at 03:14 a.m.
Lovie Smith is the anti-Greg Schiano. That's why we shouldn't be surprised that Smith will be the new coach in Tampa, according to NFL Media Insider Ian Rapoport. 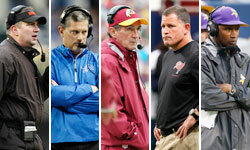 NFL teams often hire the opposite of the coach they just fired, and that is true here. Where Schiano brought drama, Smith offers the Buccaneers calm. Schiano was from the college game and unfamiliar with handling pro players. Smith has engendered loyalty and respect from his players over the course of his 16 years of NFL experience. Two years ago, Schiano struggled to put a quality staff together; Smith brings a big list of coaching and front-office contacts. He has a plan. You can fault Smith for his lack of offensive acumen, but he's undoubtedly a professional. You don't rack up an 81-63 record with three division titles without knowing how to run a team. Yes, this is going to be a popular move in Tampa. Smith cut his teeth as a linebackers coach under Tony Dungy in Tampa from 1996-2000. He's a familiar face and a tie to the organization's glory days. After Jon Gruden, Raheem Morris and Schiano, the team could use a coach who minimizes distractions. Rapoport reported earlier this week that there has been talk about bringing together a lot of former Buccaneers staffers in the front office, including former Bears general manager Jerry Angelo. And Rapoport noted that Smith's first choice for defensive coordinator is former Lions head coach Rod Marinelli, who's currently under contract with the Cowboys as a defensive line coach. If Smith can't get Marinelli out of his contract, Rapoport said don't be surprised if he brings Leslie Frazier, his good friend and the former Vikings coach as his defensive coordinator. The Buccaneers are stacked on defense. Schiano's biggest problem was that the unit didn't fully live up to its potential. Defensive tackle Gerald McCoy, linebacker Lavonte David and cornerback Darrelle Revis are all among the best players at their positions. Safeties Dashon Goldson and Mark Barron are a talented pair. The Buccaneers have the pieces in place to be a dominant group, even in a division with Cam Newton, Drew Brees and Matt Ryan. Smith's huge shortcoming as a head coach was his inability to fix the Bears offense. At least he has an original idea to fix that issue in Tampa. Sources close to Smith have told Rapoport that the plan is to bring in former Cal head coach Jeff Tedford as the offensive coordinator. Tedford, a noted developer of quarterbacks, would have decent offensive talent to work with in running back Doug Martin, wide receivers Vincent Jackson and Mike Williams and promising QB Mike Glennon. We like the idea of bringing in Tedford. But it's worth noting that Smith had a lot of offbeat ideas for coordinator in Chicago, including Mike Martz and Mike Tice. None of them worked. The Bucs are going to try to win with defense first. That's difficult to do in today's NFL, but at least Smith won't embarrass the organization while trying.